Do you want to have more flexibility when you shower, or make it easier for an older loved one? 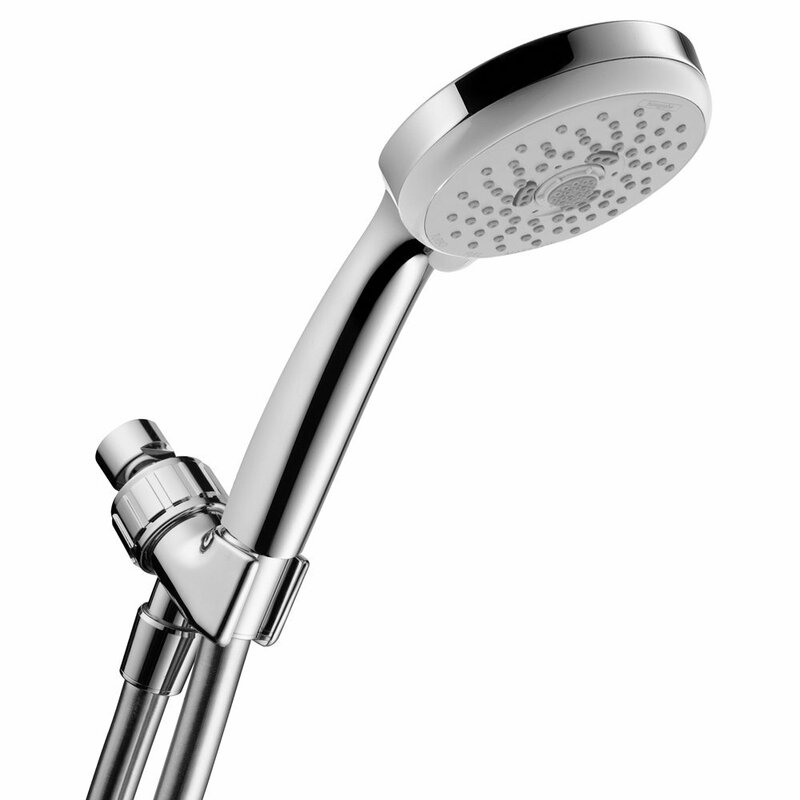 Perhaps it is time for you to consider choosing a handheld shower head. It is a switch that you will be glad you made, regardless of why you purchased it. 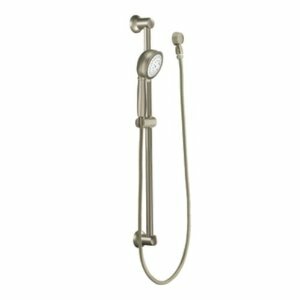 Continue reading to learn more about handshowers or click to skip down to the Best Handheld Shower Head Reviews. The Delta In2ition proves that relaxation can come in the form of a bath. This is all thanks to its H20kinetic design that saves water while providing a quality wash. It has a massaging spray as well as four other settings. There is also a pause feature which is ideal for anyone who may need to lay it on the floor while they lather up with soap, also making it a great for saving water. It is 3.4 pounds, made of brass and stainless coated plastic to give it a shinier look. You will need to purchase the arm and flange separately. As one of the top selling options on this site, you won’t be disappointed. You can see the full Delta In2ition review here. The Hansgrohe Croma is great because it gives you 63 inches of Techniflex hose to further ensure that it can reach anywhere you need it to. It comes with an arm mount and it has QuickClean technology. This resists limescale build up so you will always have a perfect soak. The different settings you will find on this large round unit include full spray, turbo spray, and pulsating massage. It weighs only 1.4 pounds to make it easy to hold onto and provides enough pressure to feel like a high pressure unit. Many people consider the Moen to be the best. This is because it has a 30″ slide bar to make it easier to set at a specific height. It also offers four spray settings that include full, massage, vigorous and a combination setting. The combo setting will keep changing the way your water sprays. It comes with a 69 inch double lock hose. Also, the unit will rotate to adjust the water spray’s angle in your stall. 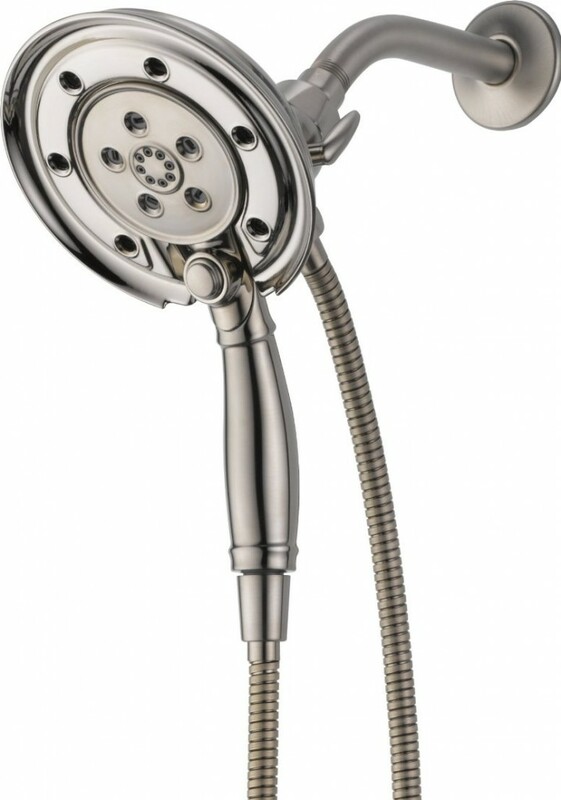 What is a Detachable Shower Head? Your typical shower head is stationary. It is attached to the wall well above your head and its purpose is to spray down over you. If you have an older family member who needs to sit in the bath or a small child, this may cause them problems. They will have a hard time getting the water adjusted so that it does not spray them in the face. A handheld can also be attached above your head and satisfy the same function. However, it can also be held in your hand so that the water goes only where you need for it to go. On most handhelds, there are also different spray settings to make it easier for you to control where the water spray lands and many come with dual heads so that you may have a fixed head and a handheld. Handheld units come in all shapes and sizes. As HGTV points out, they offer multiple functions so you do not have to sacrifice what you want. A hand shower is, beyond all things, safer for some people. With it, you will have the option to sit down and wash your hair to avoid slipping or dizziness from holding your head back. A child who does not like holding their head back and having the water hit them in the face will now be able to hold the spray closer to their heads and avoid overspray. Even your four legged family members could enjoy a bath with detachable shower head and perhaps make your life a little simpler. You will also enjoy the fact that it makes cleaning your bathroom a breeze. You will be able to skip extensive and sometimes messy tile wall cleaning issues. Just detach your unit and rinse all of the cleaners down the drain. If you choose not to use the detachable shower head, you will still gain from a having a variety of water settings to enjoy. Some of the options include a regular spray or pulsating spray as well as the mist, stream, and others possible spray settings. Each setting is designed to give you a massage while you bathe. Before you choose the one of your dreams, perhaps you should consider finding out which is the best one according to others. It may narrow down your list and make it easier for you to get the right one for your family.